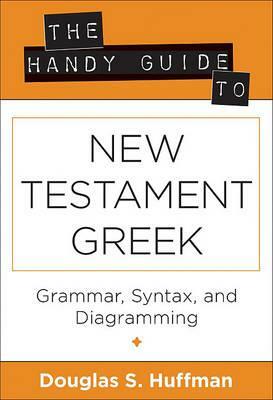 The Handy Guide to New Testament Greek is not intended for beginner-level Greek learners, but as clearly stated in the introduction, for second-year or beyond Greek students. The book basically lays out “handy” charts for grammatical and usage references, i.e. syntax, conjugation, phrase diagramming, etc. Huffman has composed a basic but accessible reference book that would be a great accompaniment to a full-sized textbook, but I think it would also be a useful tool for anyone studying Greek whether in school or out. I found his inclusion of a Select Bibliography in Greek studies particular helpful in finding other works that could be used alongside the handbook. There’s very little that separates chapters and sections. The entire book is printed in orange and black. So if you’re hoping to quickly turn to and recognize a section that you’re studying, you’ll have to first take the time to look in the table of contents and find the page number. It seems to me if a press was going to take the resources to print in color, it could have changed up the colors for each section. Tabs would have been a useful addition too, and maybe even a spiral binding so that the book can sit open flat in the section that you’re studying. For an example of a great pocket style grammar manual (English not Greek) see Diana Hacker’s “A Pocket Style Manual”. Also, I didn’t really see the logic in the organization within the three main sections. Why go from nouns, to adjectives, to adverbs, to articles, to pronouns, to prepositions, to verbs? It seems a little more logical to group parts of speech in the sense that they affect one another, for example adverbs affect verbs but they’re several pages away from one another. Overall, I think this was a great first edition, but I’d love to see a little better approachability in future editions. There’s not much here that makes it a “quick” reference, just a lighter reference than carrying around a textbook. The publisher provided a copy of this text in exchange for an honest review. All opinions are my own.